Having just returned from yet another wonderful trip to Cali, Colombia, I’ve been thinking about how much I used to think so ‘small’ in respect of what God’s plans are, even for shy, unknown, insignificant, weak, and foolish children of his. Growing up in a very ‘parochial’ shy family, who had no real aspirations to travel, no desire to be adventurous with foreign food, staying in self-contained houses and flats in the west country for holidays (so we could wash all the crockery, cutlery, bedding and disinfect the loo, bath, basin, and everything else similar you can think of before using them! ), it would never have even passed my radar that in 39 years, I’d have travelled around the world a few times, visited every continent, 111 countries (some of them, like Romania and the USA well over 100 times, Colombia not far behind…. and countries like India, and continents like Africa, both of which terrified me because of food, loos, and so many other things). ‘For I know the plans I have for you,” declares the LORD, “plans to prosper you and not to harm you, plans to give you hope and a future.’ Jeremiah heard God right on that one!! But back to my small mindedness – it blows me away when I think how limited my vision was, how small the box I’d put myself – AND God – in from a very early age, and with a ‘plan’ to spend 40 years working in a bank, to ‘accumulate’ money, get bigger and better houses, and – after 9+ years in the bank – recognising that I was both bored and boring. I might still be the latter, but I know I’m certainly not bored! I didn’t know anyone, really, outside of England – in truth, the south-east of England, let alone consider people in places like Colombia and Australia among my best friends! After about 5 or 6 years of travelling, one of my goals was to visit every nation on earth before I shuffled off this mortal coil. It’s still one of my goals, but at 111, I still have 85 to go, if you count Taiwan. My problem is that I fall in love with every country, some a little more than others (need I say Colombia?! ), so I keep going back to the same ones, like Colombia, at least 3 times a year…. I did have five totally unconnected prophetic words spoken over me in 2016, that I was going to live to the age of Moses (120 years old – so I’m just past halfway! ), so I guess there’s still plenty of time for the 85 countries. 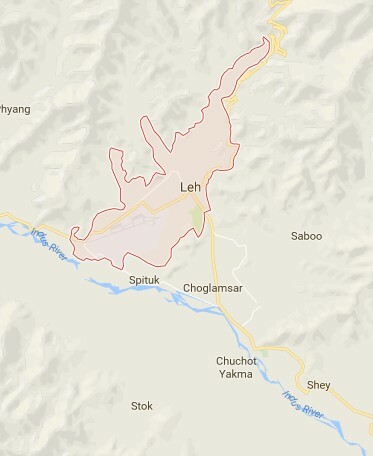 And I’ve got invitations, which I have to confirm, to 6 others in 2017 (including Nepal) – and one that gets my adrenaline going, to a city called Leh, in Kashmir: while I’ve been to India, Leh is right at the point of a triangle where India, China, and Tibet meet…. 🙂 – Tibet….YEEESS!! South-west China…..YEEESSS!!! Kashmir…..YEESSS!!!! Kathmandu (Nepal) isn’t too far from Tibet, either… :). I’ll have to ask God to give me bucket-loads of oxygen to go to Leh, as it’s up to 5,000 metres above sea-level, in the Himalayas. Look where Leh is!! If you can see the yellow lines denoting the countries, China and Tibet almost surround it….!! If you have even a sense of a call from God on your life, that will take you outside of your comfort zones, please – don’t let fear stop you. Fear has only one source – Satan – and the perfect love of God drives out all fear (1 John 4:18), and my testimony – encouragement to you – is don’t waste time letting fear hold you back. I was 4-5 years into my banking career when God made it clear that I should leave, confirmed by my mentor, Clive Calver, who was encouraging me to work for British Youth for Christ: my fear, then, was living without a salary, having had a few years of a ‘money-driven’ career, as well as stepping into the unknown (for me) of full-time ministry. I look back now and wonder why on earth I argued with God, myself, Clive, and almost anything that could delay me changing course. Many, many people say to me ‘I’d love to do what you do’. If that’s a genuine desire / call from God, then there’s only one response you’ll get from me: DO IT. Yes, it will cost you in all sorts of ways – the lifestyle you’ve been used to, maybe a regular salary, comfort, and loads more things I could list (if you want an idea, the story of Job might give you a few pointers!) – but only you can break the chains that hold you back, and when you have, you wonder why you ever ‘liked’ the chains in the first place….